Punk as a genre has seen countless quick and powerful bursts followed by unbearably long dwindles in mainstream mediocrity. Punk seems to thrive in bleak, industrial cities that are otherwise devoid of culture. Surprisingly, the brightest spot on the punk map of late is the burgeoning scene in Copenhagen, Denmark, a city known for its jazz, architecture and clean environment. Early last year, the Copenhagen-based punk quartet Iceage released their debut LP New Brigade to near universal acclaim. 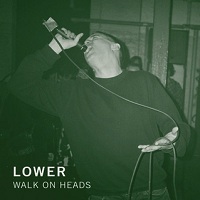 In late March 2012, Iceage’s Escho Records lablemate Lower released an eight-and-a-half minute, four-song EP: Walk On Heads. The EP, with an initial pressing of 300 copies, sold out within a week, and for good reason. What’s remarkable about Lower is that their sound, although familiar, feels less like a cheap reboot of punk’s past and more like falling in love all over again with your middle school girlfriend. It’s unlikely that you were able to pick up one of the 300 original 7” pressings of the four-song Walk On Heads EP. Escho Records is currently taking pre-orders for the repressing expected to ship mid-June. With an EP this strong, one can only hope for a fierce follow-up LP (and a stateside tour). Regardless, “Craver” proves that punk may have had a lengthy near-death experience, but it never died.